TWA – TWA means Time-Weighted Average and is the average exposure to a condition or contaminant (such as gases and vapours) to which a worker can be exposed to without adverse effect over a period of time such as an 8 hour day or a 40 hour week. This should not be confused with the concentration of a substance, which is not time-dependent. STEL – STEL means Short-Term Exposure Limit and is the acceptable average exposure over a short period of time. It usually means 15 minutes and as long as the TWA isn’t exceeded. ATEX – It consists of two EU directives which describe what equipment and work environment are allowed in an area with an explosive atmosphere when doing air sampling. Parameter – Used to identify a feature, characteristic or a measureable factor that can help to define a particular system. RFI/EMI – RFI stands for Radio Frequency Interference and is the same thing as EMI which stands for Electromagnetic Interference. Lexan – It is a transparent plastic (polycarbonate) which has high impact strength. NIOSH – The National Institute for Occupational Safety and Health. This is the American society for industrial hygienists. Haz-Mat – They are also called Hazardous Materials and are dangerous goods such as solids, liquids and gases that can harm people or other living organisms. UL Approval – Underwriters Laboratories is an independent product safety certification organization and is responsible for ATEX approvals in the USA. COSHH – The Control of Substances Hazardous to Health Regulations 2002 is a UK regulation that states the general requirements on employers to protect employees and other people from the hazards of substances used at work by risk assessment, control of exposure, health surveillance and incident planning. This means that air sampling is required to measure and monitor these substances. Microprocessor – An integrated circuit that contains all of the functions of a central processing unit of a computer. Bubble-film Calibrator – A device for calibrating personal sampling pumps that are to be used for gas or vapour collection. Sampling for gases and vapours requires a comparatively low flow rate to dust sampling and therefore the calibration method must be suitable. A ‘bubble’ or ‘film’ is created using a soap solution in the pathway of the air-flow. The time taken for this film to move up the glass tube is measured, giving the volume of air moved in one minute. Sorbent Tube – They sample hazardous gases and vapours in the air and mostly relates to Industrial Hygiene. They were developed in the USA for Air Quality Testing of Workers. They are typically made of glass and contain various types of solid absorbent material. Solid Sorbents are chosen for sampling specific compounds in the air because they trap and retain compounds of interest even in the presence of other compounds. They do not alter the compounds of interest and allow collected compounds to be easily deabsorbed or extracted for analysis. Filter Paper – A semi-permeable paper barrier which is placed perpendicular to air flow. It is used to separate fine solids from air. Filter paper comes in various porosities and grades depending on the application it is meant for. IOM Sample Head – A reusable filter cassette with a sampling head designed to better measure the workers exposure to total airborne particulates. 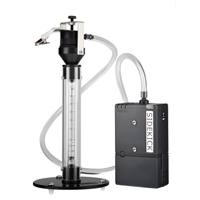 Cyclone Sample Head – It separates out respirable dust fraction from the total inhalable dust to allow the collection of respirable dust on to a filter. Parallel Particle Impactor – The Parallel Particle Impactor contains four impactors which are arranged in parallel and each of them have a different 50% cut point which targets a specific segment of the selected convention. The personal sample pump provides a 2 L/min or 8L/min flow to operate each Impactor simultaneously, but independently. The sample is collected on a single 37mm filter and is analyzed gravimetrically to provide a respirable or thoracic result which is closer to the entire range of the selected convention than any other sampler available. Total Inhalable Dust Fraction – The fraction of dust that enters the nose and mouth and may be deposited anywhere in the respiratory tract. Thoracic Fraction – The fraction that enters the Thorax and is deposited within the lung airways and the gas exchange regions.